The benefits of using a battery case on your iPhone X don’t really need to be explained. But there is a downside to slapping a battery case onto your sleek and slender flagship iPhone: you have to deal with all the bulk that comes along with it. Battery cases need a certain amount of thickness to house all that power, of course, but some designs are bulkier than others. 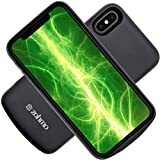 If you’re looking for the slimmest possible iPhone X battery case that will still double your battery life, the Zohmo iPhone X Battery Case is exactly what the doctor ordered. We’re not positive that it’s the thinnest iPhone X battery case in the world, as Zohmo claims, but it’s definitely the thinnest we’ve found and it does a great job of stretching the amount of time between charges.